Faculty who are assigned to an evaluation can serve as either an evaluator or an author, or both. A message displays in the To Do section on the Dashboard when an evaluation is scheduled to start. Author: Has read and write access. Responsible for submitting the written evaluation. This person is typically the chair of a committee (e.g., tenure committee) or an administrator (e.g., chair, dean, provost) responsible for completing performance evaluations.If a response is not submitted by the due date of the evaluation, the link on the Dashboard to perform the evaluation will no longer be available. The View/Respond section allows faculty to view and respond to evaluations being performed on them by other faculty members and administrators. A list of the evaluation processes display. For each evaluation process, the number of evaluations within that process, along with other related information, are shown. To view the evaluations within an evaluation process, click the View icon in the Evaluations column. The Evaluations of Me screen displays. From here, you can view an evaluation or respond to an evaluation by clicking the View/Respond icon. To respond to an evaluation, review the information in the View/Respond screen, then type your response in the Response text box. 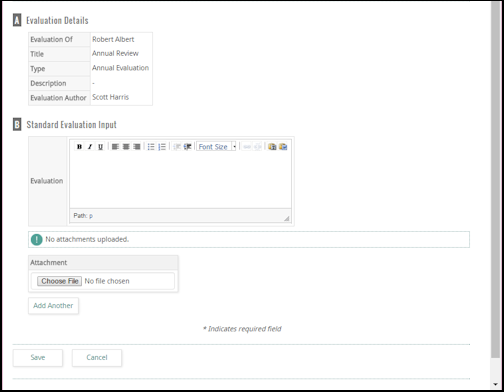 You also have the option of attaching files to your response. A message displays in the To Do section on the evaluator's Dashboard stating that a response has been submitted. Faculty members and administrators can be set up as evaluators in FACULTY180 in order to evaluate another faculty member's performance. An evaluator could be a faculty member serving on a tenure/promotion committee or an administrator serving as a chair, dean, or provost responsible for evaluating faculty performance.Evaluators are notified by e-mail when an evaluation has been assigned to them. A notification message also displays in the To Do section on their Dashboard. When an evaluation is submitted or the due date for an evaluation has passed, the link to the evaluation is removed from the Dashboard. If the due date is later extended, the evaluation link will redisplay on the Dashboard. Click Evaluations on the Navigation menu. A list of evaluations that have been assigned to you, along with the due date and other pertinent information, display. In the Perform Evaluations section, click Evaluate corresponding to the evaluation you wish to perform. The View Faculty screen displays, showing a list of faculty members that need to be evaluated as part of the selected evaluation. To begin an evaluation, click Evaluate for the desired faculty member. There is also an option to view the faculty member's tenure and promotion vita. When you have finished performing the evaluations, select the faculty member(s) for whom you wish to submit the evaluations.